Prisoners at a Queensland jail will be allowed to drink communion wine after officials bended a statewide alcohol ban to allow them to partake in communion services, The Sunday Mail reports. Wine will be brought into the chapel at Borallon Correctional Centre after the edict came from above. Prison officers fear the move could give prisoners a “taste” for alcohol with prison brew already a problem and found in centres weekly, usually made of fermented fruit. Alcohol is among a list of strictly prohibited items in the state’s jails which house thousands of prisoners who each cost the taxpayer about $65,000 per year. A directive obtained by The Sunday Mail said the wine was to be locked in a cabinet in the office of a supervisor, who will supply it to the approved chaplain conducting the church service. “An appropriate container will be provided by the centre for exclusive use of transporting the wine to the chapel for religious services,” the instruction stated. 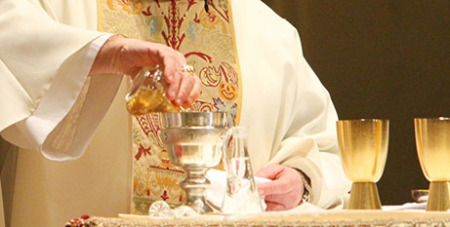 A Queensland Corrective Services spokesman said Borallon would allow diluted wine to be incorporated into communion on special occasions as requested by the Catholic priest from next year. Other unspecified Queensland jails did offer diluted wine and it was at the general manager’s discretion as to whether it was offered, according to the spokesman. “The involvement in regular religious activities by prisoners has positive rehabilitative effects,” the QCS spokesman said. In other states, Victoria provided non-alcohol wine for communion, Tasmania and the Northern Territory did not offer the Blood of Christ during communion. Chaplains can only bring in wine to South Australian prisons after consultation with management, while NSW, Western Australia and the Australian Capital Territory prisons offer small amounts for services.